Gillion served in several positions after the war, including time as a member of the United States House of Representatives. Alexander Gillion arrived in South Carolina about a decade before the American Revolution. Born in the Netherlands, Gillion had become Captain of a merchant ship. While bringing wears to Charleston, he met and married Mary Cripps. At this point, Alexander gave up his life at sea and started a successful merchant firm in his adopted home. Although Gillion was not the most vocal Revolutionary, he was elected to the last Provincial Assembly as well as the first South Carolina House of Representatives. Earning the trust of his contemporaries, Alexander was appointed as a Captain in the State Militia. Alexander Gillion was chosen as Commodore of the South Carolina Navy. He went to Europe to secure a ship to command. Gillion was able to obtain a ship, which he named the South Carolina. This vessel was manned and sailed for the United States. Unfortunately, when he returned, Charleston had been captured by the British. Gillion decided to make for Cuba. On route, he was able to capture at least ten British ships. The South Carolina then joined the Spanish fleet during an attack on New Providence. This island in the Bahamas was an important port and changed hands several times during the Revolutionary War. The war ended shortly after this expedition as too did the South Carolina Navy. Alexander returned home and became an important leader of his community. This includes starting the Charleston Chamber of Commerce as well as acting as its first President. Although he was elected to the Confederation Congress, he declined to serve. He believed the years at sea included enough time spent away from home. This opinion seems to have changed after he was a Delegate to the South Carolina Ratification Convention as he accepted election to the United States House of Representatives. Gillion served in the third Congress for just over a year, before he was the fifth Representative in American history to die while serving in the Capital. Do you want to learn about Naval Founders? Enjoy these articles on Esek Hopkins and John Paul Jones. Want to read more about the Revolution on the water? 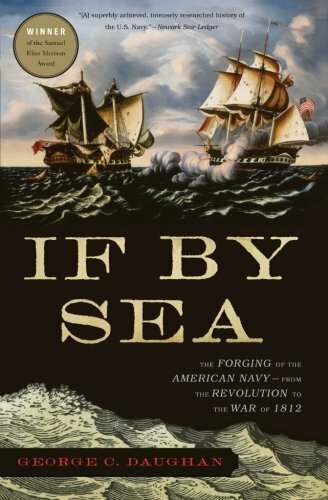 ‘If by Sea’ travels through the early history of the American Navy, from the Revolution through the War of 1812. Pick up a copy through the Amazon affiliate link below (you’ll support this site, but don’t worry, Amazon pays me while your price stays the same).